Thomas Cary’s Upper East Side apartment is a preppy paradise, meaning it’s timeless, if not eternal. John Perona’s El Morocco Family Album lies just steps from a Chipp madras blazer out of the 1960s. This photo accompanies the piece. This graphic illustrated the piece. That is an Asprey watch ($1,800), a Lilly Pulitzer jacket ($750) and a pair of Sulka slippers ($950), all from The Cary Collection. If visiting Mr. Cary’s website there is no shortage of eye candy. Yours truly was drawn to some of the Objets from classic nightclubs, like this piece from the iconic Stork Club. I’m guessing The Consort wouldn’t turn down the Secret Agent’s Aston Martin Action Car. There are such splendid treasures on Mr. Cary’s site, one can only imagine what seeing the apartment in person must be like. 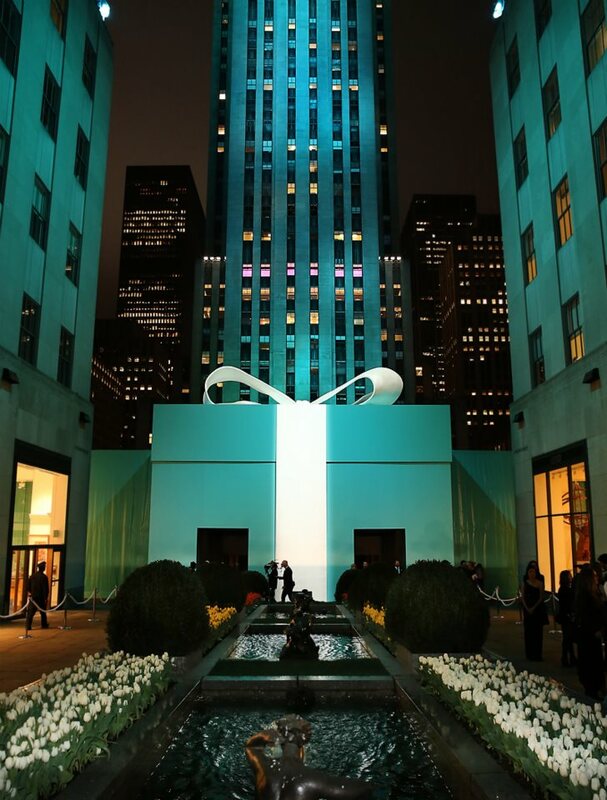 There is something fun about a giant Tiffany box. Below we see Sarah Jessica Parker in a vintage Vicky Tiel dress, Gwyneth is wearing Ralph Lauren and Kate Hudson is in a Reem Acra that is pretty darn close to that robin’s egg blue. Michelle Williams (L) and Doutzen Kroes (R) both dripping in diamonds from Tiffany. If forced, I could give up my party invite (what invite???) and simply go for the sparklies. Below, Kate Hudson, Jessica Biel and Sarah Jessica Parker. Really, just the gems and I’ll be fine. Give those tickets to some more deserving soul. On that note, g’bye until next time. If this isn’t a glorious fall day, we’re not sure what is; we hope yours is equally bright and beautiful. We have all manner of collaborative partnerships to share, almost all with a prep slant. We begin with one involving a longtime Princess fave, J. Press, and Urban Outfitters. Womenswear inclusion in a future J. Press collaboration would make us a very happy camper indeed. Next, a partnership we have previously mentioned, and one that has had us more than a tad nervous. Yes, it is the Amy Winehouse Fred Perry collection, definitely in the You Can’t Make this Stuff Up category. While the talented performer’s troubled history would make it easy to mock the line, the reality is that there are many appealing pieces, especially for those of us hopelessly lost in the fifties. It is unlikely we shall acquire anything from the line, for as much as we like many of the items, we also recognize our limitations, knowing we would forever associate pieces with Ms. Winehouse and the frequently unfortunate circumstances she frequently finds herself in, despite her amazing talents. However, it *is* an extremely fun group to graze, click here to do just that. 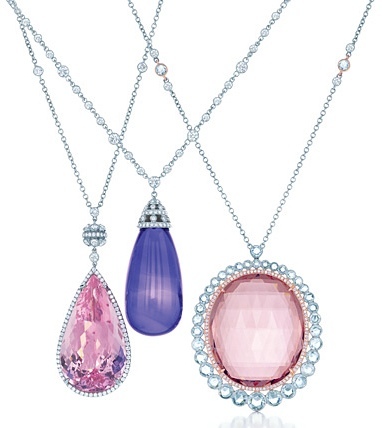 Our next collection has received oodles of coverage, and we are more than a little late to the party on this one. (“Late to the party” being a teevee snooze news term referencing ‘old news’ ((yes, an oxymoron, we understand that)), perilously akin to ‘moldy oldie,’ news coverage that should not be allowed to float out over the airwaves.) Of course we are talking about the Lanvin H&M collection. There are some amazing party frocks, among other goodies. 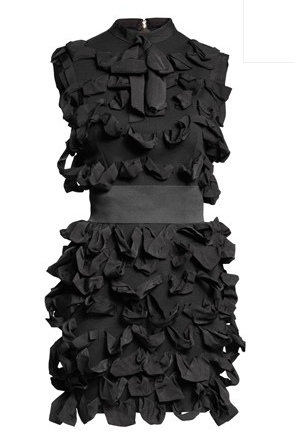 The Guardian has more, referencing Lanvin design genius Alber Elbaz. The line approaches “we’ll take one of each” levels. Unfortunately, the Prepatorium is not located near an H&M, and the company does not sell online in the US. The word ‘droolworthy’ comes to mind. How popular does H&M expect the collection to be? We go back to the Guardian for that answer. The collection launches November 23, to see all of the goodies, pop over to Vogue UK for the lookbook. Sigh. Our final collaborative endeavor involves a perennial favorite, The Gap, and an unlikely partner, Valentino. It is a very small line, only seven pieces, launching in late November, but only available at Gap stores in London and new Milan shop, as well as online at the super-hip Colette. We want to do what we believe is called a ‘shout out’ to friend and fab designer Kiel James Patrick. His hometown paper has done quite the spread on his growing company, describing his creations as “New Prep,” perhaps a surprise to Kiel, certainly an old school prep if ever we met one. We love that the story points that it was Sarah Vickers, Kiel’s longtime partner and collaborator, who suggested he actually start the company. (Go Sarah!) We are proud to carry many of Kiel and Sarah’s designs here at the Princess, including KJP headbands and earrings. It’s always nice to see good things happen to good people, especially these two. Polo Ralph Lauren is doing its “Private Sale” (don’t get us started on the ‘privacy’ of said sale), offering up to 40% off regular prices, as well as an additional 15% off the 40% off. Use promo code NOV0410 to receive the additional discount. Also offering discounted goods, Bergdorf Goodman. The retailer’s fall sale kicked off today. Until next time, grins and giggles! Hello-Hello, and happy Thursday, it is simply beautiful here at the Prepatorium, we hope you are enjoying equally blissful conditions. Once again we are brief, the crush of business remains a significant factor in the day, leaving little time for tea and bon-bons. Sniff. We begin with an update on Fashion’s Night Out, a repeat of last year’s event during New York Fashion Week, created to get people shopping again. Ahem. Below, a photo from the news conference announcing some of the festivities planned for September 10. Eagle-eyed readers will recognize some of the notables at that event, including Francisco Costa, Tory Burch, Mayor Bloomberg, Anna Wintour and Marc Jacobs. “In one typical example of mixed messages, the big reveal for the Fashion’s Night Out Sept. 10 party lineup (celebrities and events galore at hundreds of stores staying open until 11 p.m.) appeared in an issue of Women’s Wear Daily that was otherwise dedicated to a theme of fashion frugality. “Mindless excess is over,” the trend forecaster Faith Popcorn said, right there on its front page. One of the many specialty items being offered for the event, the toile and striped sneakers Keds has created for Opening Ceremony. There are activities and parties scheduled all over the country, perhaps there are festivities in your corner of the globe as well. We have a number of SOPS (Sales & Savings Opportunites) to share, beginning with the private sale at Tory Burch, offering up to 60% off retail prices. Savings are significant on pieces like the Auden Cardigan (originally $250, now $100) and the Espadrille Ballet Flat ($46 from $116). Saks is doing an online-only clearance. Bargains abound at Polo Ralph Lauren as well, its Last Chance sale is underway, with savings up to 70%. Here is a photo of the couple, although it dates back to 2008. We have a quick update on two stars from everyone’s favorite faux-prep school show, Gossip Girl. Also gracing a cover, costar Chace Crawford. Mr. Crawford was showcased in last week’s issue of ES, the Evening Standard’s magazine. We leave you with several images we have been hoping to share for some time. Yes, that is a cat, as is this. They were part of the “Fashionable Feline Extravaganza,” an event put together by the North Shore Animal League. Below, Carmen Miranda lives. And they are connected to preppish styles or fashion… how? Not. at. all. For more wacky photos, pop over to Refinery 29. Until next time, may you be surrounded by sunshine and smiles! It really should be a One-Topic Tuesday here at the Prepatorium, we have too many multiple commitments this afternoon and evening and should limit our time here with you, but there is more than one topic to share, so we shall hurry our way through these items. Some readers may recall our post sharing news that Bergdorf Goodman was opening a Children’s Department, Little bg; it is now open. For loads of fun photos showcasing the new department, pop in to the Stylish Tot. We continue seizing any, and every opportunity to showcase footwear for the tiny preps in your life, it is all simply too precious to resist. Little bg doesn’t disappoint in this arena, and we also adore the Watermelon Seersucker Dress by Florence Eiseman, today’s Pretty in Pink. “If J Crew were a woman, she would know how to bake cupcakes, and prefer the bedroom to the boardroom. I can see SATC’s Charlotte in J Crew, but none of the others. Writer Liz Jones focuses on several key pieces, including this tee shown in the article. The caption in the paper reads: “Too flimsy: The J crew T-shirt, £32“. To be fair, American tee-shirts as a whole are thrashed in the story. The retailer’s Tiered Brique Skirt is also written off as “just awful”. Below left we show the image from the story and on the right, the skirt as seen on the US website. 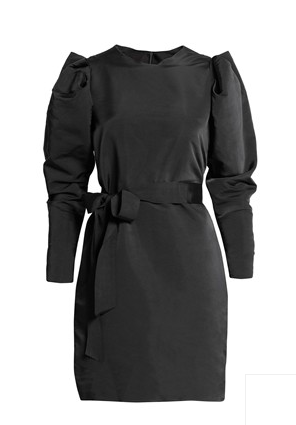 But then we get to an unnamed party frock: . “There’s a J Crew dress that looks fabulous in photographs, but don’t be deceived.The embellishment is too heavy for the fabric, and the horizontal stripes make even the slimmest woman look wide. Also shown in the story, this gown. Above we show the Delphinia gown ($350 USD) as seen in the story (L) and on the J. Crew website. The caption in the Mail’s story reads: “The maxi dress: £230 but looks cheap“. To read the entire story, just click here. We are just delighted to share a few goodies new to the shop, beginning with an addition to the Kiel James Patrick for the Preppy Princess Collection. This is our new KJP Madras and Rope headband, designed by Kiel and made exclusively for us, absolutely one of our fave items from this talented young man. We were especially tickled that Kiel made time to design this (and a few other new treasures not yet on the site), as he is smack in the middle of creating his new Collegiate Collection, soon to be available at the Harvard Coop and Dartmouth Bookstore. We are guessing these will fly out of both stores. At the speed of light. In addition to the new KJP Collegiate Collection, we are ever-so-excited to be assisting the designer extraordinaire with a new product launch in the next month! Until then we are only able to share this image. Sigh. May your afternoon and evening be simply fabulous! Hello-Hello everyone, hopefully the sun is shining as brightly at your palace as it is here, there is nary a cloud in the sky, it is simply gorgeous. Oh yes indeedy, TP is sharing these not-quite-exclusive photos from the Snuggie show at Fashion Week. We ask, where else will you see shots of not only an adult Snuggie, but a pink one for your pooch? Look at this amazing photo from backstage – the anticipatory excitement is palpable. Can you feel it? The show was held at the Park Avenue Hotel (oh my! ), and forced fashion mavens to make an exceptionally difficult decision: how does one choose between this amazing event and the Mulberry or Brian Reyes shows? Don’t let it be said we don’t share the joy here at the Prepatorium, nay-nay, meeting your every fashion and style need is our goal. Indeed. Readers know we also try and meet those goals by sharing photos of the fashionistas from that faux-prep school show Gossip Girl. Below, Blake Lively was on hand for the Marchesa show. Party frocks extraordinaire from a firm that knows design, draping and drama, and executes all of them perfectly. How about this for a stroll down the aisle? 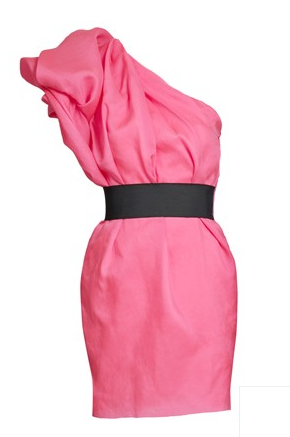 And while much too chic for us, we’ll say this is a Pretty in Pink for today, it is one stunning gown. Also yesterday, Leighton Meester heads into the 3.1 Phillip Lim show. Ms. Meester also attended the Proenza Schouler show; we share a group of looks from that collection as put together at Time. Next, Time’s collage of Narciso Rodriguez pieces for next spring. Perhaps of more interest to our readers – the Tory Burch presentation yesterday. We found some styles appealing, and others just so-so. We thought some looks oozed comfy, snuggly, casual fun. That is news of a logotastic sort. There is more big news out of Fashion Week: a second designer will launch a collection on eBay. First we had news that Narciso Rodriguez plans an 8-piece capsule collection to be sold next spring. And today news broke via Women’s Wear Daily that Norma Kamali will also sell a line on eBay, with pieces priced under $250. This is in addition to the collection she already does for Walmart, NK for Walmart. Very quickly before we fly, two shameless pieces of self-promotion, beginning with news that our Whitney English notesheets made the October O List! And the second item is merely a reminder to enter our Giveaway for a free personalized Preppy Platter or Plate! Ideal as a gift, for the holidays, or anytime, these are fun, durable, and dishwasher-safe. Click here to join the fun and enter before midnight tonight (9.17.09), we announce the winner tomorrow! Also tomorrow, the Polo Ralph Lauren show and more prepalicious fun from Fashion Week. Hello-Hello, and welcome to a wacky Wednesday that feels like a Tuesday. We cannot tell you how many times TSU has been required to answer the question “Okay, quick, is Tuesday or Wednesday?” But there shan’t be any complaining about the shortened week here at the Prepatorium, nay-nay, it is a lovely concept, simply bliss in our little brain! Pricepoints for the gowns are expected to range from $2,300 to $3,500; the line will include fifteen styles available this fall. All over the country tomorrow night hundreds of stores will be staying open until at least 11pm, offering special promotions, gifts with purchase, and more. Events range from free chocolates at Maison du Chocolat (the Rockefeller Center store) to the Olsen twins serving drinks at Bergdorf Goodman. If not out watching the Open, shoppers at Cole-Haan (on Madison) can meet Maria Sharapova, showing her new Collection again (previewed in this post), while also sampling goodies from Dylan’s Candy Bar. As is the case with almost any event held these days, one may acquire a tee-shirt commemorating the occasion. For those not attending in person, the shirt is available online at Needless Markup Neiman Marcus. The nice thing about the tee? 40% of the proceeds are being donated to the National September 11 Memorial & Museum at the World Trade Center. A number of Preptastic retailers are participating, including Lilly Pulitzer. Lilly plans include giving shoppers a chance to see some of the amazing designers in action at the Mother Ship on Madison Avenue, and it seems there will be liquid refreshments as well, the invitation does say “Cocktails and creativity will flow.” For more on all of the Lilly events, click here. Tory Burch has even designed a special tote for the occasion. Purchase *anything* at either the Nolita or Meatpacking stores and one of the limited edition totes is yours. Kate Spade shoppers have an opportunity to party, as the retailer is offering cha-cha lessons and Havana highballs will be served! Brooks Brothers is unveiling a yet-to-be-announced product, Polo Ralph Lauren is hosting an art event, and J. Crew is promoting their Jewelry/Accessories store by offering refreshments and a chance to meet a jewelry designer. We have read of several bloggers planning to partake of the festivities, including the fabulous Magnolias, Marriage & Manhattan. There are also events scheduled all over the country, including Los Angeles and Orange County, San Francisco and Chicago. If interested, check online, in the local newpaper or at the official FNO site. For a list of events in London, click here. 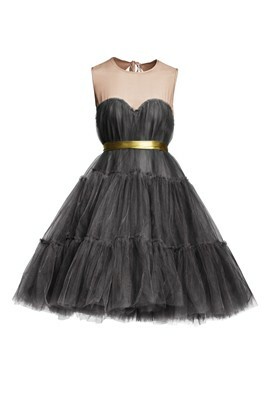 One other quick note: the Anna Sui Gossip Girl-inspired line for Target launches tomorrow. Below, a look at the ‘Blair dress‘ as seen in a print ad for the retailer. “But can fashionable entertainment persuade people to pay full price when they are still feeling queasy and bloated from over-spending? We are curious about your thoughts on shopping…? Do you spend less time engaged in that activity than you did a year or two ago? Did you always look for bargains regardless of the economy, or are you more cognizant of that now? Do you have any concerns about being perceived as someone who is a conspicuous consumer, or are things essentially the same? Is your perception of luxury different in any way? You know TP has an inquiring mind, and she is simply dying to hear your reactions to this idea of an evening spent celebrating shopping.